For professional recording engineers, Pro Tools is the industry standard, but creative types will find it surprisingly suitable—there's even a free version to get you started. Since its inception, Pro Tools’s outstanding mixing board mimicry has made it the pro's choice for upscale audio recording and manipulation—the recording industry’s DAW, as it were. That’s its bread and butter and it’s very intuitive for traditional studio engineers. For artists? Enh. However, over the years, Pro Tools has acquired MIDI and sequencing abilities, as well as notation, so it’s a more than competent tool for creative purposes. In fact, the program’s in-line editing (editing done right on the track rather than a separate window) makes it a favorite of many. Pro Tools fell behind in the home creative audio market not so much because of creative lacks, but restrictive marketing practices. Prior to version 9, you needed an M-Powered consumer audio interface that was limited to 48kHz, or expensive, proprietary hardware if you wanted to record at bit rates beyond that. Avid still markets the high-end hardware which is quite nice-sounding, but it’s no longer joined at the hip with the software. 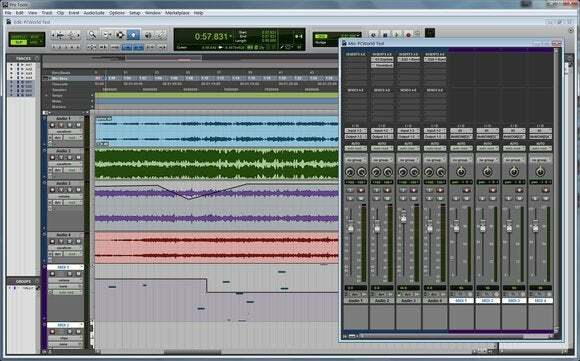 Pro Tools First offers enough power for most home studio projects, and is free for up to three simultaneous projects. It does require and iLok account and Internet acces. In the interim, there have been major changes to the way the program is marketed and sold. Besides no longer restricting your choices in hardware, Avid now offers a free version of Pro Tools called First. It allows only three concurrent projects and limits tracks to 16, but is adequate for most home projects and a great way to kick the tires of the industry standard. You must set up accounts with both Avid and iLok to handle the license. Projects can be edited locally, but they can also be stored online for remote access and there’s an online community. The collaboration possibilities are enticing. The vast majority of the improvements to Pro Tools, other than the aforementioned in-line editing made since I reviewed version 8.04 have been enhancements to editing features, or under the hood: the new AAX plug-in architecture, plug-in latency compensation, and a 64-bit audio engine. Avid also dumped the older TDM and RTAS plug-in formats, much to the chagrin of many existing users, some of whom have stuck with version 10.3. There are also risks to wholesale code rewrites. Two versions on and I discovered a bug in enumerating audio devices when there was no Windows audio device present that consistently crashed the program. If you’re new to Pro Tools and have the issue, open the program without opening a file, open the Playback Engine dialog, change nothing if your interface is selected, click okay, and you should be good to go. Note that Pro Tools only supports ASIO devices so you’ll need ASIO4All for integrated motherboard audio chips. Editing audio pan in Pro Tools with the track full-window. The latest Pro Tools version 12 (First is a version of 12) adds audio manipulation features, such as batch fades and commit, which takes those hundreds of edits Pro Tools engineers make and quickly bounces them to a clean audio track. Nothing revolutionary, but certainly welcome, time-saving improvements. Pro Tools First may attract new users, but there’s at least one hurdle to adoption by more experienced DAW users—lack of native support for VST plug-ins and instruments, which are used in every DAW outside of Pro Tools and Apple’s Logic. There are AAX versions of most popular VST instruments and effects, but few users want to start kludging immediately with a third-party wrapper for their favorite plug-ins that aren’t supported. Regardless of what I called out as ownership hurdles, when it comes to recording and manipulating audio, as well as finalizing production, Pro Tools is as good as it gets. It also has a certain cachet as it’s what the pros use—the results can be heard on thousands of hit songs. And, because the program interfaces seamlessly with so much professional audio equipment, including external DSPs for processing super high-quality effects, it is likely to remain a mainstay of studios around the world. 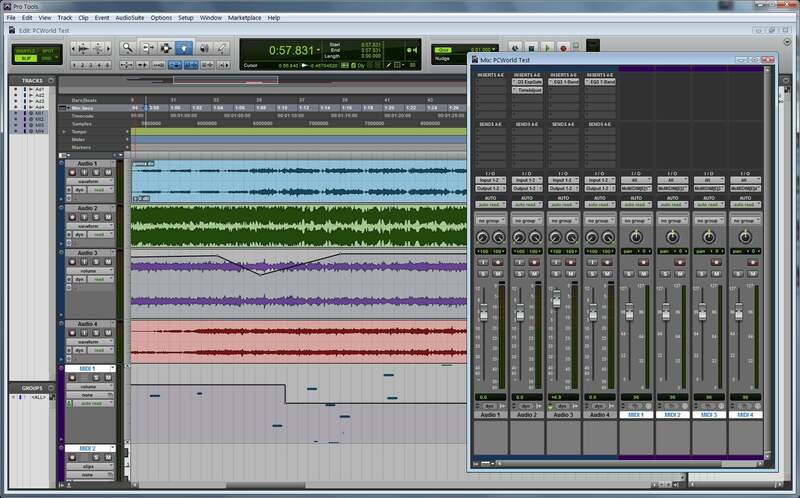 A multi-track project in Pro Tools 12 with the mixing window visible. 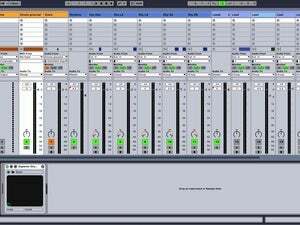 Most pro setups will utilize a two-display setup with the tracks on one and the virtual mixing console on the other. The countless hours recording engineers have spent learning and using the program will also keep it in good stead. Sitting in a studio and watching a pro use Pro Tools is a fascinating experience. And yes, top artists still use studios because of their acoustic properties, communal and social vibe, and because they provide people who sweat the details while the artist performs. Pro Tools comes in the traditional $699 standalone package, but is now also available as a monthly rental of about $30. There are also yearly upgrade and support contracts, as well as plug-in rentals. I’m not sure how the brave new world of software rental and pay support is working for Avid’s existing customer base, but it sure does make it easy to try stuff. 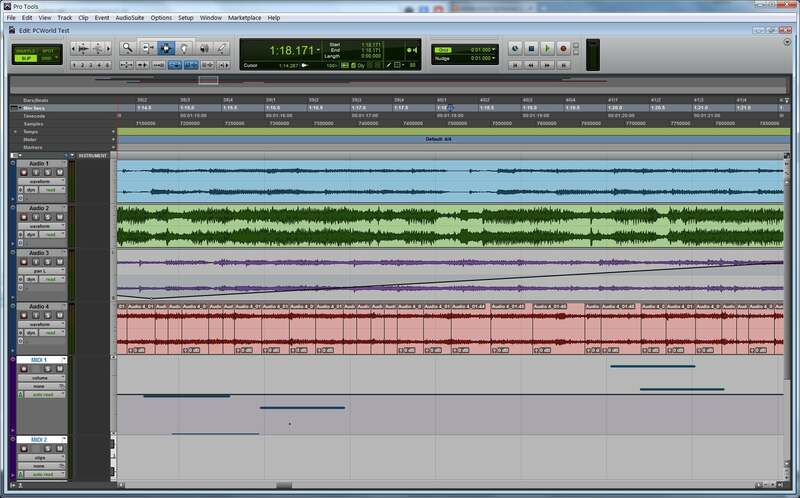 An audio track (red) split into parts by transients (note onsets) that will be familiar to thousands of Pro Tools users. Fortunately for everyone, you can continue to use whatever DAW you want, then transfer things into Pro Tools later—it has very good import capabilities. There’s of course MIDI and audio file import, but the easiest way is via an OMF (Open Media Framework) file exported by Logic, Cubase, Sonar, Pro Tools and others. Either way, an experienced Pro Tools engineer can recreate an external project in no time. And you’ll probably only need a bit longer. 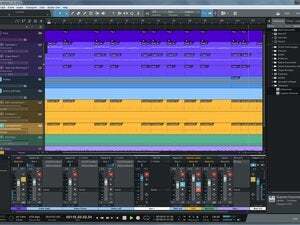 If you haven’t settled on a DAW yet, you should definitely take a look at Pro Tools. It’s the cream of the crop for audio recording and production. It’s also far more viable as a creative tool than you might expect. And, the free First version is huge for the hordes of budding musicians struggling to pay the rent. 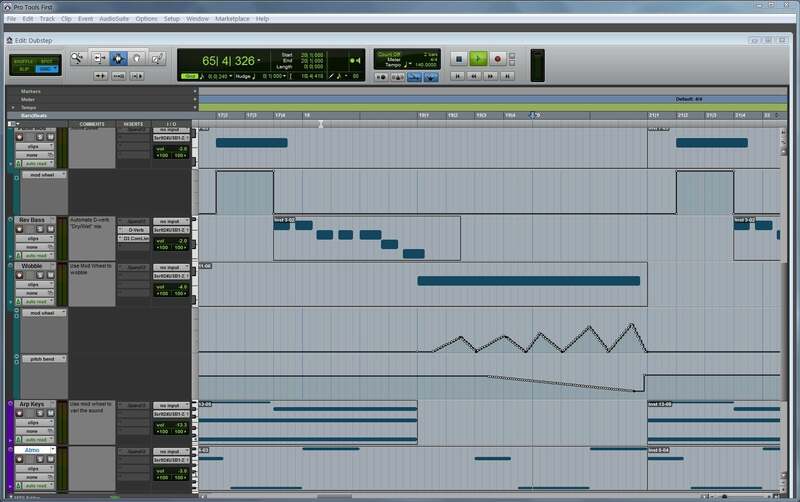 Only Presonus’s Studio One offers a free version that’s as capable as First. Additionally, if you have any ambition at all of becoming a professional sound engineer, then you need to know Pro Tools. At least for the foreseeable future. It can’t hurt if you’re an artist either—it always pays to know what your engineer or producer is up to. 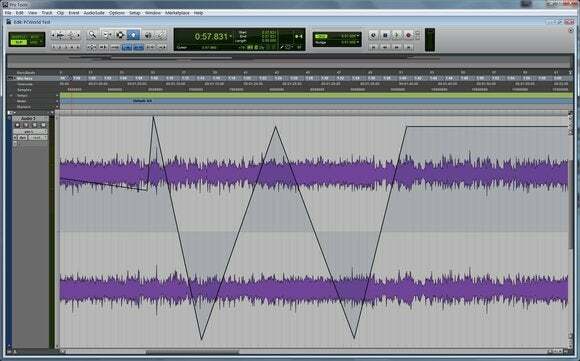 Pro Tools is the DAW that's synonymous with computer audio and pro-level digital recording. Indeed, it's rare to find a studio without a Pro Tools system these days. The creative tools are good, but nothing special, though in-line editing of audio and MIDI directly on the tracks will be an appealing feature for some. While Pro Tools is the pro's choice, there's a free "First" version for starving musicians. Even if you prefer another DAW, transferring the tracks to Pro Tools before you hit the studio can be a real time and money saver.